Hey: Today I find myself a little cranky. Ok a lot cranky!! I did what most of us crafters do I headed to the craft room to get rid of my bad mood. first I came upon an idea-ology tray set. Rip off the packaging and decided this was going to be used. Kinda a big deal because I am a self diagnosed TH hoarder. Anyone else? Given my mood ripping up the packaging felt kinda good. Next I grab a Tim Holtz 8x8 pad of paper (Etcetera) I've decided to do a torn paper collage. I pulled out a few piece of paper and started tearing and inking. 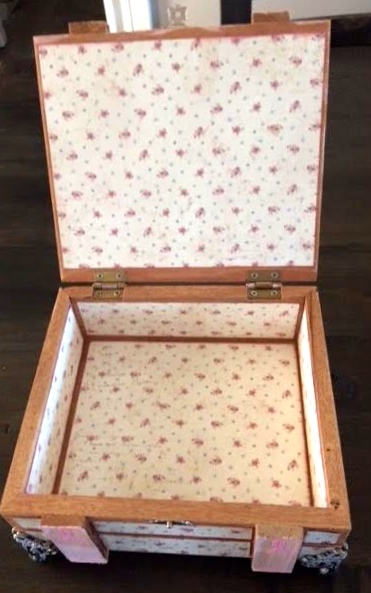 I made a couple of Kathy Ortas hidden hinges to fit my tray and made a few pockets for tags. I have a ton from all the years of TH monthy tags. I decorated every pocket I made front and back with torn and inked paper. The tearing of the paper helped with my mood and what I came up with is a tray with pockets to hold tags. How does everyone else un-cranky themselves? Hi : One of the looks I love is that crusty patina finish of old weathered metal, so when Finnabair came out with a paste collection I started hunting for it. I got my hands on the collection last week. I decided I'd start small. I had this spice jar that had a vanilla bean in it. I covered it with gesso so everything would stick. 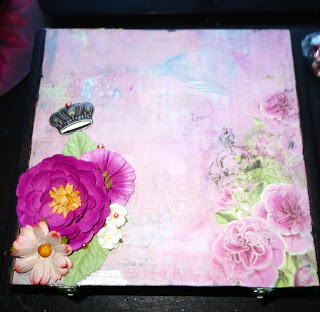 Then I glued on some Tim Holtz idea-ology flowers and some ribbon trim at the top. Then I started applying the paste as Finnabair showed in her video. this is my result. so fun and so easy!! Hope you like it!! for an extra touch I add some Finnabair wax paste. Hi : It's been awhile !!! I carved out a little time to put together a scrapbook page. I used this gorgeous paper line by bo bunny called Aryia's garden. I've only been able to find the collection pack! 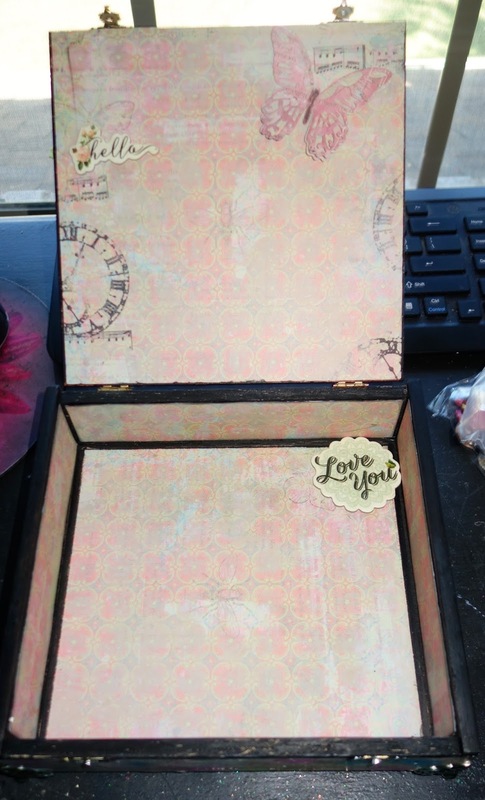 I used some Tim Holtz distress stain (Picked Raspberry and Tumbled glass ) and water to make it drip down the page, some Dusty Attic chipboard corner which I painted with gesso and Peeled paint distress ink, and a few idea-ology industrious sticker. Simon Says Monday Challenge is- " Splash it on". So of course I'm entering in on the fun. I hope you like it!! Hi All: It's been awhile since my last post!! I've been working on mini albums, a wedding album for my niece, and I finished a quilt that only took 7 years. 7 years ago my friend Kristi Everett a wonderful woman I worked at Michaels with gave me a Beautiful top part of a quilt that she had sewn. I of course at the time didn't know how to sew nor did I own a working sewing machine. I promised her I would make the rest of the quilt. And so this wonderful piece of art sat in a bag for 3 years. Along comes another wonderful woman into my life Rayann Ulvick. I have a previous post of curtains and pillows I made with Rayann's help. Before the curtains and pillow she helped me start on the quilt. I was sent to the store to get thread, batting and material for the back piece. Rayann is patient and kind teacher!!! I ironed, learned to thread my sewing machine ( which I finally got 4 years ago to use on paper), what thread not to buy, and with her help got to work and finished most of the quilt. Then back in the bag it went and sat until the 12/26/2016. I just had the edge trim to add so finally after Christmas last year I unbagged the quilt and finished. 4 years ago Rayann had cut and measured the trimI just had to sew the trim on. Not perfect, but I'm proud of it anyway. Do any of you have unfinished projects? Here is the finished results. Over at Creative Carte Blanche this months theme is "Be you- Song lyrics inspiration"
I had to think on this for a while because like some of you I listen to different music depending what I'm doing!! Cleaning is usually Van Halen ( yes I just aged myself) , Laundry and mending is more soothing like movie theme music Harry Potter , When i need to get myself out of a funk or just motivated my go to is Masterpiece by Jesse J. This page I've had done for awhile. One problem no matter what I did I couldn't get one of the lyrics ( the one on the bottom) in focus. I tried everything so I'm just going to type it. " You haven't seen the best of me I'm still working on my masterpiece"
I love this song!! I blare it to my daughters dismay. I although call it payback for all the times she's gives me a early wake- up call . hope you like it. This months tag for the Tim Holtz's 12 tags of 2016 became a journey of cleaning out my craft room to find my shadow press station. So now with my room cleaner and my tools organized I got to work. I didn't have any Christmas shadow press. So I used Journey. Because at this time of year are we all not on some kind of journey? The hunt for the perfect gift, the adventure trying to find it at a good price, and the stress of getting it all done in time. All I can say is thank you Amazon prime. I got out my die cutting machine out ( vagabond) and cut two tags one for a base and the other out tim's textile surfaces ( burlap). got my holiday knit stencil and applied candied apple distress ink on the burlap. Now to crafting I then dug around and found several packs of Tim Holtz paper with Christmas themes to make my tiles with. I used bottle alcohol ink on and idea-ology star, applied some jute string and arrow from- yep idea-ology. I used a wreath and bells from my stash and more jute on the top. I wanted the journey to stand out more so I used red stickies to sparkle it up a little. Evening all: I finally got to play at my craft desk. So I played all day trying to come up with a tag or card I like for my November entry to the Tim Holtz 12 tags of 2016 . I love this dragonfly stamp . It's an old one but a favorite. 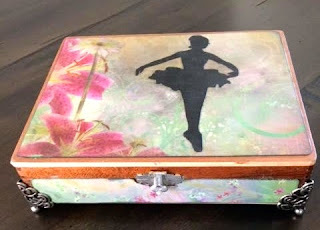 For this tag we were supposed to use the spray stain, I have a hard time keeping control of where I spray so inside a shoebox my tag goes; otherwise I end up spraying everything. After adding my remnant rubs I applied my distress spray ( stormy sky, crack pistachio, faded jeans, and spun sugar). I added water to make the colors blend and drip. I used my distress crayons on my dragonfly and fussy cut it out. I wanted a little sparkle so I added wink of stella. I cut my peace from the Christmas thinnest set. attached the cork peace to some corrugated cardboard and then to my tag with tiny brads. Hope you like it. Hi all: Yep almost late again. This time I cut it way close. Here is my Tim Holtz remix October 2016 tag ( clipboard) I love how creative making the collage background allows you to be. I cut my pieces and took apart my clipboard got out my collage medium (vintage) and put a good layer down and added my pieces. I outlined my pieces with the black soot crayon. Ran my candle light die cut and used the spider. Heres my finished product. Hope you like it!! Happy October All: I was looking through Pinterest a few months back and discovered Lavinia Stamps; and I'm hooked. These stamps speak to the whimsey in me. I know dorky. So back in June I ordered a few. The stamp company is in the U.K. so shipping takes awhile. So bummer my order hadn't arrived my the middle of August so I emailed the company. Worked with both Jane and Tracy and they sent me a new order. I finally got them last weekend. And I must tell you I fell in love with this witch stamp. Witchy Woman- Well this stamp is perfect. so my pulled out my inks, canvas, water color paper, paints, plastic, stickies, perfect pearls and stamps and got to work. I made a few color combos to see what screamed Halloween to me. I made a couple of messes and in the trash they went. I sometime have trouble inking the stamps that aren't rubber. So I went through a few pieces of scratch and water color paper. Once I got the scene the way I wanted it. This is what I came up with. Hope you like it. Just uploading my Tim Holtz- September tag for the 12 tags of 2016 remix. i must have watched the video at least 50 times. this was not a simple or easy effect to pull off. my first one too light. The next one I pressed too hard and didn't make sure to use a clean area to wipe. Big mistake!! I kinda liked the car though. The third time was the charm. I really liked the effect of the 2 tone swiggle background. I put the alcohol ink (Indigo and Teakwood) in 2 long stripes each on my applicator and wiggled as I placed it on the Yupo. I got these thick lines of color. Then I inked my butterfly stamp from the Perspective cms213 set from Stampers anonymous with Ranger Archival ink Potting soil stamped my image and gently wiped using the clean area of my felt. This is what I came up with. Hi : It's been a really long time I know. I been traveling, working, and basically just running around getting stuff done. I'm seriously ready to take a breather. I just realized it was only a couple of days till the end of the month and I hadn't even looked at what the Tim Holtz August tag for 2016. So over the weekend I got to work. The techniques were fun to experiment with. Brayered stained was challenging, because I want to color it all. So instead I went sideways instead of up and down. I used distressed ink - wild honey, fossilized amber and picked raspberry. I also used fossilized amber distress paint on my framework pieces. The frameworks part was much easier for me. I love these dies, they are like little puzzles. I hope you all like it. Afternoon : Today I needed to do something creative. You know those days where you need something happy; making things makes me happy. 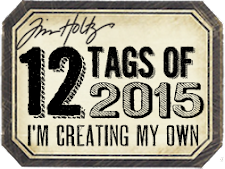 So I decided to a make my July tag for the Tim Holtz's 12 of 2016. I know a shocker but, for this one my idea came fast. I love those cityscape stamps by Stampers Anonymous & Tim Holtz, so I dug them out and just started playing. I am usually inspired by colors before anything else, how about you guys/gals? So I looked online to see the colors of the city. Cracked Pistachio is the perfect distress color for the Statue of Liberty and the top of 40 Wall Street. From there I continued water coloring with different Distress pens and then used a gel glitter pen to add a little sparkle. When I was done painting I dried the picture. Which for once I did on the smooth side of the watercolor paper. I added Distress Glaze and rubbed off the extra with a paper towel. Next thinlet time where I cutout my words on a craft tag and used a craft knife to make a belly band to slide my watercolor picture in. Next add a few Ideology items and twine. This was a fun tag to make. I'm going to laminate this and use it on my luggage. Hey- I'm still experimenting with my journal. This time I used distress ink, stencils with paste and different texture gels. I forgot how much fun a journal is!! The hardest part is waiting for your different mediums to dry so you can try something else. Simon Says Stamp also has a Wednesday challenge that I decided to enter my journal page in. Hope you like it!! Hi All: I've decided when I'm cleaning the studio I need someone to tell me to put stuff down. My goal today was to clean out my studio. I have trash bags, kids crafting tubs, and give away piles. I was doing good until I ran across my Dyan Reaveley journal. You know the one with the craft cover. I started looking at it, and then I found a stash bag from H.L. and there were clearance stamps I bought and never put away. I put the journal and stamps on my desk. Organized a few more shelves and then I was bored. Yep I started playing in the journal. As I always do I looked online at Simon Says blog to see what the Simon Says Monday Challenge was. This week its Tic Tac Toe- This is my attempt at Tic-Tac- Toe . I used one of the stamps in the bag ( the tricycle) and another stamp that says summer to me, some washi tapend twine. Embossed, then sprayed with distress spray and inked with distress ink. Hope you like it. Hi All: Yep it's the last day of the month and I'm just not finishing my Tim Holtz's technique remix tag for June's 12 tags of 2016. I do this all the time!!! And I shouldn't have because this tag ran the gambit. New surfaces- substrate sheets and textile surfaces. Stamped on tissue wrap , die cut, vintage collage medium, and even got out the sewing machine. I'm getting a little better at the sewing thing. So here is my tag. Hope you like it. Afternoon All: We finally have a little sunshine. Not for long though I hear :-( . Where I live in North Texas it's either feast or famine with rain. Anyway enough of that. A couple of my friends and I were talking about blogs. Two of us have them and Beth who doesn't said she wished people would sometimes post their oops projects just so people who don't have blogs would know they aren't the only ones who make mistakes. Well from that comment we launched into a bunch of different discussions which is why hanging out with friends is so fun. By the end of the conversation both Teressa and I promised to post something that wasn't perfect; of which I have a ton. Anyone else?? Loved it!!! here's my tag . Now as I promised Beth my oops. I got to mad at myself. I was loving how my cover was turning out then I looked at my piece---- Really I couldn't have noticed it earlier. do ya see what I did. The backward lefty strikes again. thanks of looking!! 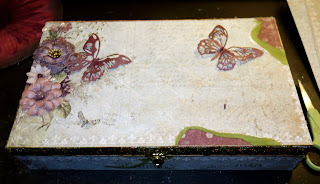 Hi: I'm working on a butterfly box for Simon Says Stamp Monday Challenge. I used Sanctuary by Blue Fern Studios called Botanical Gardens, Hope you like it!! Hey again: When it rains I play in my craft room. Actually I do dishes, pick up, sweep, cook (well some meals) and then I craft. Which is normally late at night. I made this card for 2 Simon Says Challenges. There is the Simon Says Monday Challenge which is-April showers bring may flowers ; and for Simon says Wednesday Challenge- Lets do polka dots. Hope you like it. Last weekend I spent several hours altering a couple cigar boxes for my friend Rayann so she could take them home to Canada. It was one of those races against the clock craft days, because there was packing to do and a plane to catch. One is for an auction for breast cancer and the other is a gift. 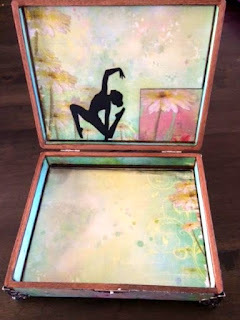 Since over at Creative Card Blanche the April Adventure is an Altered cigar box I thought I'd share these 2 - First one is called the Hope Box. The second one is called the The Dancer. Have you ever had an art tool that you had to have but, you don't use it? I had to have the luminary 3-D the second the die was released. I got it home unpackaged it, put it on the shelf with my other Alterations dies. There it has sat for a couple of years now. My neighbors have this really cute lantern on their outside table and when this months Tim Holtz 12 tags of 2016 included Mosaic I knew just what I wanted to do. Yep I finally pulled out my Luminary die dusted it off and used it. I messed a few up of course. Once i figured the top was a u-fold things went pretty smoothly. If I do another mosaic with this die I'm going to do one panel at a time with the grout. My card stock got a little soggy. I made a couple of different roofs. Hope you like it. Hi All: I was walking through Michaels the other day and came across some canvas for 60% off. It kinda got my attention since thats what I went for. I went back to the isle I got the not on sale canvas and put it back. I'm not a fan of creating extra work for someone else. went back and bought several instead of just 1; and paid less. A lot less. I went home and started to play. While the gesso was drying I went on the internet looked at several sites. Over at Simon Says Wednesday Challenge they're theme is "Anything goes" and I also discovered Creative Carte Blanche. 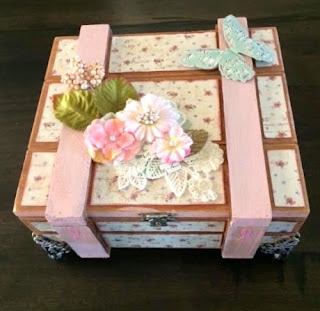 It's a new blog started by some of my favorite crafters. You really need to check it out if you love challenges. I missed creative adventure #1 and almost #2. So #2 is called "Triple trouble" and you have to use lace, corrugated paper, and metal on an art project. After the gesso dried I used Picked Raspberry and Cracked Pistachio distress paint in random places over the gesso. I decided the picked raspberry was a little bright so I mixed some gesso with it and mellowed it out a little. I then used some Art Anthology spray (Ink Spot). This is a new product that I found at a craft show here in Texas. This spray dries so fast. I decided the canvas needed a little texture, to do this I used some Liquitex glass beads multi medium. I had a corrugated flower I at one point attached a burlap flower too (Tattered floral die) I had made awhile back and a scrap piece in my stash so I included those and applied the same paint and spray on those to tie the brushes in. I also the queen of forgetting and I'm always leaving my brushes in product and not cleaning them. Instead of throwing them away I painted them with the same colors and glued the to the canvas back and added some tulle and a bead spray from Mon Ami Gabby On the other side I die cut some butterflies from Tm Holtz. 2 are from the new butterfly thinlets and the one on the bottom is on of his mover and shapers. To get my metal in the piece I used pen nibs for 2 of the butterfly bodies and a corner piece from Idea-ology. As for my lace piece I just used a base stitch on some 2 inch lace ribbon and created a flower. the added 2 pre made flowers from my stash to complete. So here is mine mixed media piece I hope you like it. And thanks for looking! !